Seattle Dental and Denture Arts offers all of your dental implant needs under one roof. We’ve made dental implants our specialty. Implant surgery, restoration, maintenance, and repair are all offered at our facility. From single dental implants to denture stabilization to full-arch fixed “All-On-4” bridges we are your dental implant solution. An implant-supported bridge can be used to replace as few as 3 missing teeth. Bridges are also an option if you are missing all of your teeth. It is not necessary to place an implant for every missing tooth. 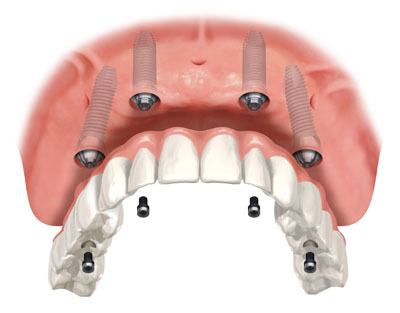 As few as 2 implants can be placed to support a smaller bridge. This can lessen the cost to replace multiple missing teeth. 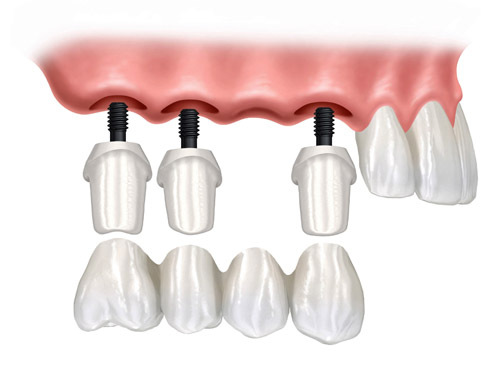 Learn how an Implant Bridge can benefit you! There are many ways to replace all of your missing teeth with an implant-supported bridge, ranging from traditional grafting techniques to the All-On-4 technique. Typically we can use either your existing bone or replacement “grafted” bone to hold 4-6 implants which support a bridge that is screwed into them. The All-On-4 technique allows us to maximize the use of existing bone by angling the implants without requiring bone grafting procedures. Once the implants have been placed and healing has occurred, called osseointegration, small connectors, called abutments, are attached to the implants. The final bridge is fabricated and then secured to the abutments with screws. This type of prosthesis is fixed in place and can only be removed by a dentist and it is much smaller than a denture. Implant-supported bridges look, feel, and function like real teeth They are more comfortable and stable than conventional dentures, thus allowing you to retain a more natural biting and chewing capacity. Your implant-supported bridge can make you feel more whole and confident. You brush and floss around it, like natural teeth. It is stable so you can eat your favorite foods and no one will know that it’s not your natural teeth! Lastly, missing teeth and bone structure may result in unwanted changes to your appearance. Your lips can lose support and your cheeks can sink in. Both situations can make a person appear older and can result in wrinkles. Replacing this lost structure with an implant-supported bridge can take years off of your appearance and keep you looking and feeling young! Contact us for a free consultation! Dr. Hodges teaches how to design and restore full-arch bridges nationally, and he is one of the most highly experienced doctors in the Seattle area for full-arch “All-On-4” restorations. Upper implants can take 6 months to fuse to your bone, called osseointegration, and lower implants can take 4 months. Implant supported bridges are a very complex procedure so planning and preparation time is required. You may have heard of “Teeth in a Day” but that “Day” is preceded by several weeks of preparation, so the sooner you start treatment the sooner you can look great, feel great, and start eating your favorite foods! Please visit our Seattle office, near Pikes Place Market, for your Dental Implant needs. For questions or to call ahead, call our office line: (206) 623-1140. If you call after hours, follow instructions to get in contact with someone from our office. We will schedule you in as soon as possible. When the health of your smile is at risk or you are missing teeth, our practice is here to help. Dr. Hodges provides extensive Implants and restorative dental care to safeguard your oral health. Call us today, or use our online form to schedule an appointment.